On December 4, some 200 farmers arrived at the cotton procurement centre in Yavatmal tehsil of Maharashtra, with about 60 tonnes of cotton loaded in carts and tractor trolleys. They demanded the minimum support price (msp) of Rs 3,000 per 100 kg promised by the Centre. This sent the employees of the Maharashtra Cotton Federation, the nodal body for procuring cotton in the state, in a tizzy. While farmers said their cotton had the average fibre length, also called staple length, of 28 mm required to qualify for the rate of Rs 3,000 per 100 kg, the federation employees argued that the micronear quality of the cotton, indicating strength, fell short of the standard. After a heated debate, one trolley-load of cotton was procured at Rs 3,000.The federation promised to send samples of the remaining cotton to Nagpur for tests. Suryakant Gade Patil, the president of the state marketing board called the Agriculture Produce Market Committee in Yavatmal tehsil, who led the farmers, alleged the procurement centre in Pandharkawda tehsil of Yavatmal district was paying farmers Rs 3,000 per 100 kg without quality check, while elsewhere in the state farmers were getting a lower rate for good quality cotton. One of the three farmers of Yavatmal tehsil who had sold their cotton at Pandharkawda for Rs 3,000 per 100 kg, Sheshrao Pawar admitted, "The land in our village Bothbodan is inferior and our cotton is also low quality." The expectancy created by the record msp of Rs 3,000 died down as soon as procurement by the Maharashtra Cotton Federation and the Cotton Corporation of India (cci), the central procuring agency, started on November 1, a month later than usual. Farmers at all centres in the state, except in Pandharkawda, are not getting more than Rs 2,850 per 100 kg. In many parts of Maharashtra's cotton belt Vidarbha, infamous for suicides, procurement was repeatedly suspended due to cloudy weather, running up farmers' transport cost. The local media reported that many farmers were selling in panic at reduced prices because of the closures. "Last year when we sold our cotton the price was barely Rs 2,400 per 100 kg. It rose to Rs 3,500 after farmers had sold out. This year we hoped for a better deal, but now they are not even paying msp," said farmer Madhukar Jhunge of Nimgaon village in Wardha district, whose 900 kg of cotton was priced at Rs 2,850 per 100 kg. By November 24, about 223.1 million kg of cotton had been procured in Maharashtra, according to the Cotton Federation. Private traders had bought 77.4 million kg, while the federation, on behalf of agri-cooperative major nafed, had purchased 34.1 million kg. cci had bought 111.8 million kg. While private buyers blame the reduced price on the international slump in demand for cotton, officials of government agencies say it is because of the low quality of cotton. At the state marketing board in Wardha, grader S U Charjan said, "In most places we are receiving cotton of up to 28 mm staple length, hence the price." Charjan grades cotton for the Cotton Federation. A cci procurer, who refused to be named, agreed. 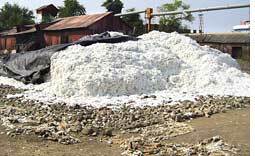 In Nagpur, Cotton Federation president M P Hirani said, "The maximum msp of Rs 3,000 is conditional to a 28.5 staple length, micronear level of 35 and moisture content of 8 per cent or less. We have publicized these rules through newspapers, TV and handbills, but farmers do not understand them." msp for medium-staple is Rs 2,500 per 100 kg. Farmers dismiss the quality argument. Anil Pachpore of Datala village in Buldhana district, said, "The cotton in our village has staple length between 29.25 mm and 32 mm. Still we are getting Rs 2,800 per 100 kg. No grading is taking place here. The price is fixed." Traders and spinning mill owners say even the price at which they are buying is unrealistic. Since the announcement of cotton msps--up to 47 per cent higher than the previous year's--the cotton price in the international market has crashed by Rs 500 per 100 kg. "Taking into account the worldwide recession, the msp is unrealistic," said Pramod Shende, the deputy speaker of the Maharashtra Assembly and chairperson of the cooperative spinning mill Indira Sahakari Soot Girni in Wardha. Asked why then the mill procured cotton at rates from Rs 2,860 to Rs 3,011 per 100 kg, Shende said it would result in a loss for the mill. Yogendra Fattepuria, cotton trader and owner of the Paras Cotton Ginning and Pressing Factory in Wardha, said he could not make purchases at all this year because of the high price. "During the last season the price of bales (roughly 170 kg and 10 times of raw cotton's) had gone up from Rs 19,000 to Rs 28,000 between January and May, while msp was Rs 2,030. 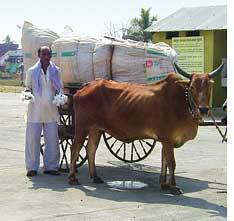 This year msp is Rs 3,000, but the price of bales has dropped to Rs 22,500 in Maharashtra," he said. On the condition of anonymity, a procurement officer at Wardha said cci could lose Rs 1,500 crore. Vijay Jawandhia, an activist belonging to the Shetkari Sanghatana, a farmers' movement in Maharashtra, said mill owners were wrongly linking their problems to msp. "The mills have been reaping the benefits of the low cotton price in the international market sustained by US subsidies, but they grudge the little protection our farmers have in the form of msp," said Jawandhia. He demanded the government provide an export subsidy on cotton to ease the pressure on farmers and mills. Farmers insist the support price is meant to protect farmers from market ups and downs. "This year the support price should have been Rs 4,000 in view of the repeated agricultural disasters," said Shrirang Gholve of Dorli village in Yavatmal. Farmers are in financial distress owing to the soybean pest attack and drought followed by lalya, a disease that turns cotton leaves rust-coloured and brings down the yield sharply. "Due to lalya farmers who used to reap about 1.5 tonnes of cotton per hectare (ha) in this area are harvesting half a tonne. There are going to be more loans and suicides," said Gholve. Activists allege the government is using every trick in the book to favour traders over farmers. Chandrakant Wankhede, a Nagpur-based writer and veteran activist of Shetkari Sanghatana, said, "Political pressure forced the government to raise the price, but now it is delaying procurement and putting absurd conditions like buying cotton of only a certain grade and only allowing buyers who own ginning-pressing units." Gajanan Amdabadkar, a Washim-based activist of the group, said, "The local market has turned unfavourable for farmers because under industry pressure the import duty on cotton was scrapped. If the duty is reimposed, the local prices could go up." Whatever the market condition, the farming community has lost faith in the grading mechanism. At Yavatmal, farmers point out that the test of micronear quality, which beat down prices, was not carried out in the presence of farmers. "We don't know when the tests were carried out," said Gade Patil. "We were just told the results." Hirani denied the allegation, saying, "There are labs in Nagpur and Akola where samples are tested for micronear quality every week." He said the micronear quality is decided zone-wise on the basis of randomly selected samples because testing all samples would be too costly and time-consuming. "nafed will check every bale before taking possession, and low-quality bales would be rejected. Officials responsible will lose their jobs," Hirani said. If quality checks are so rigorous, ask farmers, how is it that those with poor quality cotton got the maximum msp at Pandharkawda? Gade Patil, who plans to file a writ petition on the issue of msp, said, "We demand that grading mechanisms be made transparent. The high msp had raised farmers' hopes, but the grading system has made a hoax out of it."